Former Rep. Jerry Weller (R., Ill.) and some of his lobbying firm's clients are distancing themselves from a longtime Democratic lobbyist who was indicted in September on multiple charges that he and his wife embezzled $1.4 million from the company and campaign where they respectively worked. David Miller, a lawyer and former Senate Banking Committee staffer, faces allegations that he and his wife embezzled more than $650,000 from the campaign fund of a fellow Democratic Virginia state senator and used an autism charity to pay for personal trips and his mortgage. 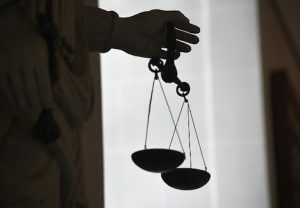 A grand jury convened by the U.S. Court for the Eastern District of Virginia indicted Miller on charges of mail and wire fraud, conspiracy to launder "monetary interests," and "aggravated identity theft." Miller is accused of partnering with his wife, Lynn Wallis, in three fraud schemes between 2011 and 2014, including embezzling from the campaign fund of Virginia State Sen. Richard Saslaw. Wallis, who served as Saslaw's treasurer in his state senator campaign, is now serving 56 months in prison for her role in the schemes. She was also ordered to pay $1.4 million in restitution. Weller, a member of the House of Representatives from 1995 to 2009, told the Washington Free Beacon that he had recently terminated Miller's lobbying contract with World Group Public Affairs, or NWG, and told him to inform his clients of his termination. "I no longer have a business relationship with him," Weller said in an emailed statement. "He was only contracted to do work for those he was registered with." "He informed me of his legal situation last week, and it was the first I was aware of his legal situation," he added. "Again, he no longer has a relationship with NWG as a consultant." Lobbying registration records show Miller worked for NWG for the past two and a half years on accounts for clients including the Puerto Rico Manufacturers' Association, or PRMA, the Puerto Private Sector Coalition, Thermo Fisher Scientific, Ariel Investment Management, Highland Pharmaceuticals and the Direct Selling Association. Despite the lobbying records, Weller said Miller actually only worked on Thermo Fisher Scientific, Highland Pharmaceutical, and PRMA. A PRMA spokeswoman said the Free Beacon informed her of Miller's indictment and the group reached out to Weller who informed them that Miller was terminated. "The charges related to the indictment are from a situation not related to any work at NWG and related to a previous employment of Mr. Miller," the spokeswoman said. In a phone call to the Free Beacon, Miller accused Saslaw of trying to hurt his reputation by spreading news of the indictment. Miller did not respond to a follow-up call and several email inquiries. A spokeswoman for Saslaw said, "The senator has no comments." In the case against his wife, "D.M." was listed as a co-conspirator in court documents. The district attorney's office in Alexandria said that Wallis, during her tenure as Saslaw's treasurer from June 2013 to Sept. 2014, wrote approximately 70 fraudulent checks from the campaign account without Saslaw's permission or knowledge. Additionally, Miller and his wife allegedly set up fake law firms as a way to fraudulently bill Miller's employer, SkyLink Air and Logistic Support, for hundreds of thousands of dollars, according to the indictment against Miller. The couple also allegedly misused funds from a charity they cofounded called the Community College Consortium on Autism and Intellectual Disabilities, which focused on the role community colleges could play in providing affordable curricula to people with autism and intellectual disabilities. According to court documents, the couple presented the charity as a nonprofit to donors but never applied to the IRS for non-profit status for the organization. The organization collected $293,000 from community colleges around the country, as well as a Bulgarian businessman who donated $500,000 to the group, the documents allege. Between April 2010 and 2014, Wallis transferred a total of $482,000 from the charity's account to other bank accounts Wallis or and Miller controlled. The indictment and previous court documents allege that a large portion of that $482,000 went to pay Wallis's personal expenses, such as mortgages on both his primary residence and an oceanfront vacation property in Bethany Beach, Del., food and restaurants, and a vacation to Jamaica. According to the indictment against Miller, the couple used a private aircraft to fly to Jamaica where they rented a 9,000-square foot beachfront villa equipped with a full staff, including "butler, chef, housekeeper, laundress, and gardener, as well as a private pool, heated Jacuzzi, tennis court, gazebo, and three-hole putting green by the sea." Miller ran as a Democrat for clerk of the Circuit Court in Fairfax County in 2007. He dropped out after reports that he owed more than $38,000 in federal income taxes. He said at the time that he didn’t know "anything about" the failure to the pay the back taxes. Miller's bio lists his former legal and lobbying clients, including the American Bankers Association, American Airlines, Chase Manhattan Bank, and the Mayo Clinic. It also says he worked at one point in his career as the director for taxation for the National Association of Manufacturers. A 2007 Washington Post article said he had previously lobbied for the Church of Scientology.